Laptop. Tablet. Tent. Stand. 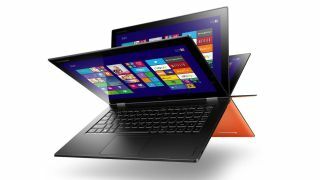 That's always been the four-mode mantra of the Lenovo Yoga and Lenovo has announced a new generation model at IFA 2013 – the 13.3-inch Yoga 2 Pro. Aimed at the business market and featuring Windows 8 Pro, the new model stuns with a whopping QuadHD+ 3,200 x 1,800 resolution touchscreen. Compare that to the old model, with its 1,600 x 900 resolution. The new version is also slightly thinner than the old version, at 1.5mm instead of 17.1mm. As you might expect, there's also a bit of weight removed so it's now 1.4Kg. Considering that most non-flip Ultrabooks are hitting that weight, this is very impressive. Check out our review of the original ThinkPad Yoga and the smaller Yoga 11S. The resolution of the Yoga 2 Pro is way more than the 2,560 x 1,440 WQHD display we saw announced in yesterday's new 13.3-inch Asus Zenbook range and the same as Samsung's Ativ Book 9 Plus (also 13.3-inch, that's 275 ppi and we'll be reviewing it any day now on TechRadar). The 13.3-inch MacBook Pro retina is a low 2,560 x 1,600 by comparison. If you've seen one, you'll know that we're joking with the 'low' bit – it's stunning. Gesture support and voice control also feature in the Yoga 2 Pro. There are also Haswell-generation Intel Core processors up to Core i7 plus up to a 9 hour battery life and Intel Wireless display. The new ThinkPad Yoga price is 1299 Euros and the Yoga 2 Pro release date is October. The 11S also gets an update with new processors, although availability on that is currently unclear. Why not check out our Yoga 11S review?